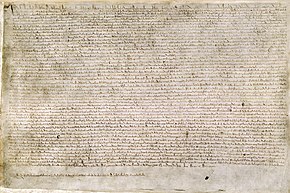 ↑ The document's Latin name is spelled either Magna Carta or Magna Charta, (the pronunciation is the same) and, in English, with or without the definite article "the". Latin does not have a definite article equivalent to "the". The Oxford English Dictionary recommends usage without the definite article. The spelling Charta originates in the 18th century, as a restoration of classical Latin charta for the Medieval Latin spelling carta. While "Charta" remains an acceptable variant spelling it never became prevalent in English usage. ↑ Within this article, dates before 14 September 1752 are in the Julian calendar. Later dates are in the Gregorian calendar. 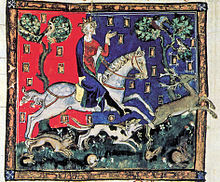 In the Gregorian calendar, however, the date would have been 22 June 1215. ↑ "Magna Carta, n.". Oxford English Dictionary. Retrieved 20 November 2014. (subscription required (help)).